The Duchy of Thuringia was an eastern frontier march of the Merovingian kingdom of Austrasia, established about 631 by King Dagobert I after his troops had been defeated by the forces of the Slavic confederation of Samo at the Battle of Wogastisburg. It was recreated in the Carolingian Empire and its dukes appointed by the king until it was absorbed by the Saxon dukes in 908. From about 1111/12 the territory was ruled by the Landgraves of Thuringia as Princes of the Holy Roman Empire. The former kingdom of the Thuringii arose during the Migration Period after the decline of the Hunnic Empire in Central Europe in the mid 5th century, culminating in their defeat in the 454 Battle of Nedao. With Bisinus a first Thuringian king is documented about 500, who ruled over extended estates that stretched beyond the Main River in the south. His son and successor Hermanafrid married Amalaberga, a niece of the Ostrogoth king Theoderic the Great, thereby hedging the threat of incursions by the Merovingian Franks in the west. However, when King Theoderic died in 526, they took the occasion to invade the Thuringian lands and finally carried off the victory in a 531 battle on the Unstrut River. King Theuderic of Rheims had Hermanafrid trapped in Zülpich (Tolbiacum) where the last Thuringian king was killed. His niece Princess Radegund was kidnapped by King Chlothar I and died in exile in 586. The Thuringian realm was shattered: the territory north of the Harz mountain range was settled by Saxon tribes, while the Franks moved into the southern parts on the Main River. The estates east of the Saale River were beyond Frankish control and taken over by Polabian Slavs. The first documented duke (dux) of remaining Thuringia was a local noble named Radulf, installed by King Dagobert in the early 630s. Radulf was able to secure the Frankish border along the Saale River in the east from Slavic incursions. However, according to the Chronicle of Fredegar, in 641/2 his victories "turned his head" (i.e., made him proud) and he allied with Samo and rebelled against Dagobert's successor, King Sigebert III, even going so far as to declare himself king (rex) of Thuringia. A punitive expedition led by the Frankish Mayor of the Palace Grimoald ultimately failed and Radulf was able to maintain his semi-autonomous position. His successors of the local ducal dynasty, the Hedenen, supported missionary activity within the duchy, but seem to have lost their hold on Thuringia after the rise of the Pippinids in the early eighth century. A conflict with Charles Martel around 717–19 brought an end to autonomy. In 849, the eastern part of Thuringia was organised as the limes Sorabicus, or Sorbian March, and placed under a duke named Thachulf. In the Annals of Fulda his title is dux Sorabici limitis, "duke of the Sorbian frontier", but he and his successors were commonly known as duces Thuringorum, "dukes of the Thuringians", as they set about establishing their power over the old duchy. After Thachulf's death in 873, the Sorbs rose in revolt and he was succeeded by his son Radulf. In 880, King Louis replaced Radulf with Poppo, perhaps a kinsman. Poppo instigated a war with Saxony in 882 and in 883 he and his brother Egino fought a civil war for control of Thuringia, in which the latter was victorious. Egino died in 886 and Poppo resumed command. In 892, King Arnulf replaced Poppo with Conrad. This was an act of patronage by the king, for Conrad's house, the Conradines, were soon feuding with Poppo's, the Babenbergs. But Conrad's rule was short, perhaps because he had a lack of local support. He was replaced by Burchard, whose title in 903 was marchio Thuringionum, "margrave of the Thuringians". Burchard had to defend Thuringia from the incursions of the Magyars and was defeated and killed in battle, along with the former duke Egino, on 3 August 908. He was the last recorded duke of Thuringia. The duchy was the smallest of the so-called "younger stem duchies", and was absorbed by Saxony after Burchard's death, when Burchard's sons were finally expelled by Duke Henry the Fowler in 913. The Thuringians remained a distinct people, and in the Middle Ages their land was organised as a landgraviate. The Landgraviate of Thuringia within the Empire around the middle of the 13th century. 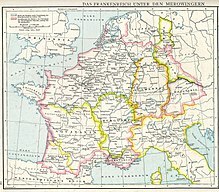 A separate Thuringian stem duchy did not exist during the emergence of the German kingdom from East Francia in the 10th century. Large parts of the Thuringian estates were controlled by the Counts of Weimar and the Margraves of Meissen. According to the medieval chronicler Thietmar of Merseburg, Margrave Eckard I (d. 1002) was appointed Thuringian duke. After his assassination 1002, Count William II of Weimar acted as Thuringian spokesman with King Henry II of Germany. In 1111/12 Count Herman I of Winzenburg is documented as a Thuringian landgrave, the first mention of a secession from Saxony, however, he later had to yield as he sided with the Papacy during the Investiture Controversy. Meanwhile, the Franconian aristocrat Louis the Springer (1042–1123) laid the foundations for the erection of Wartburg Castle, which became the residence of his descendants who, beginning with his son Louis I, served as Thuringian landgraves. Louis I had married the Rhenish Franconian countess Hedwig of Gudensberg and became the heir of extended estates in Thuringia and Hesse. A close ally of King Lothair II of Germany against the rising Hohenstaufen dynasty, he was appointed Landgrave of Thuringia in 1131. The dynasty maintained the landgraviate throughout the fierce struggle of the Hohenstaufen and Welf royal families, occasionally switching sides according to the circumstances. Beside the Wartburg, the Ludowingian landgraves had further lavish residences erected, like Neuenburg Castle ("New Castle") near Freyburg, and Marburg Castle in their Hessian estates. In the "Golden Age" under Hohenstaufen rule, Thuringia became a centre of Middle High German culture, epitomized by the legendary Sängerkrieg at the Wartburg, or the ministry of Saint Elizabeth, the daughter of King Andrew II of Hungary. When Landgrave Louis IV married her in 1221, the Ludowingian dynasty had accomplished the advancement to one of the mightiest princely houses of the Holy Roman Empire. Under the rule of the landgraves town privileges were conferred to Mühlhausen and Nordhausen which became Free imperial cities, while the largest city Erfurt remained a possession of the Prince-Archbishops of Mainz. The landgraves maintained close ties with the Teutonic Knights, the order established several commandries east of the Saale, as in Altenburg and Schleiz, with the administrative seat of the Thuringian bailiwick in Zwätzen near Jena. The last Thuringian landgrave Henry Raspe reached his appointment as German governor by the Hohenstaufen emperor Frederick II in 1242. However, when Frederick was declared deposed by Pope Innocent IV in 1246, he secured the support by the archbishops Siegfried III of Mainz and Conrad of Cologne and had himself elected German anti-king. Mocked as rex clericorum his rule remained disputed, though he was able to defeat the troops of Frederick's son Conrad IV he died one year later. His heritage was claimed by both the Wettin margrave Henry III of Meissen, son of Judith of Thuringia, and Duchess Sophie of Brabant, daughter of late Landgrave Louis IV - a conflict that led to the War of the Thuringian Succession. As a result, Henry of Meissen gained the bulk of Thuringia in 1264, while the Hessian possessions of the landgraves was separated as the Landgraviate of Hesse under the rule of Sophie's son Henry I. The Meissen margraves of the Wettin dynasty retained the landgravial title. Upon the death of Margrave Frederick III of Meissen his younger brothers divided their heritage in the 1382 Division of Chemnitz, whereby Thuringia passed to Balthasar. Upon the death of Landgrave Frederick IV in 1440, Thuringia fell to his nephew Elector Frederick II of Saxony, the inheritance conflict with his brother William III led to the 1445 Division of Altenburg and the Saxon Fratricidal War over the Wettin lands. The Thuringian lands fell to William III, when he died childless in 1482, Elector Ernest, inherited the landgraviate, uniting the Wettin lands under his rule. After the 1485 Treaty of Leipzig, Thuringia split into the Saxon Ernestine and Albertine duchies. ^ Reuter, Timothy (1991). Germany in the Early Middle Ages, 800–1056. New York: Longman. p. 55. ISBN 0582081564. ^ Curta, Florin (2001). The Making of the Slavs: History and Archaeology of the Lower Danube Region, ca. 500–700. Cambridge: Cambridge University Press. pp. 61, 109. ISBN 0521802024. ^ Wood, Ian (2000). "Before or After Mission: Social Relations across the Middle and Lower Rhine in the Seventh and Eighth Centuries". In Hansen, Inge Lyse; Wickham, Chris. The Long Eighth Century: Production, Distribution and Demand. Leiden: Brill. pp. 149–166. ISBN 9004117237. ^ Reuter, Annals of Fulda, s. a. 882 and 883. ^ Reuter, Germany in the Early Middle Ages, 123. ^ Reuter, Germany in the Early Middle Ages, 129. ^ Santosuosso, Antonio (2004). Barbarians, Marauders, and Infidels: The Ways of Medieval Warfare. New York: MJF Books. p. 148. ISBN 0813391539. ^ Mitchell, Otis C. (1985). Two German Crowns: Monarchy and Empire in Medieval Germany. Bristol, IN: Wyndham Hall Press. p. 90. ISBN 0932269664. ^ Reuter, Germany in the Early Middle Ages, 133. Gerd Tellenbach. Königtum und Stämme in der Werdezeit des Deutschen Reiches. Quellen und Studien zur Verfassungsgeschichte des Deutschen Reiches in Mittelalter und Neuzeit, vol. 7, pt. 4. Weimar, 1939. This is a list of rulers of Hesse during the history of Hesse on west-central Germany. These rulers belonged to a dynasty collectively known as the House of Hesse and the House of Brabant, originally the Reginar. Hesse was ruled as a Landgraviate, Electorate and later as a Grand duchy until 1918. Frederick I, the Belligerent or the Warlike, a member of the House of Wettin, ruled as Margrave of Meissen from 1407 and Elector of Saxony from 1423 until his death. Henry III, called Henry the Illustrious from the House of Wettin was Margrave of Meissen and last Margrave of Lusatia from 1221 until his death; from 1242 also Landgrave of Thuringia. The Treaty of Leipzig or Partition of Leipzig was signed on 11 November 1485 between Elector Ernest of Saxony and his younger brother Albert III, the sons of Elector Frederick II of Saxony from the House of Wettin. The agreement perpetuated the division of the Wettin lands into a Saxon and a Thuringian part, which in the long run obstructed the further development of a Central German hegemonic power in favour of Brandenburg-Prussia. The Landgraviate of Hesse was a principality of the Holy Roman Empire. It existed as a single entity from 1264 to 1567, when it was divided between the sons of Philip I, Landgrave of Hesse. Henneberg was a medieval German comital family (Grafen) which from the 11th century onwards held large territories in the Duchy of Franconia. Their county was raised to a princely county in 1310. The March or Margraviate of Lusatia was as an eastern border march of the Holy Roman Empire in the lands settled by Polabian Slavs. It arose in 965 in the course of the partition of the vast Marca Geronis. Ruled by several Saxon margravial dynasties, among them the House of Wettin, the lordship was contested by the Polish kings as well as by the Ascanian margraves of Brandenburg. The remaining territory was finally incorporated into the Lands of the Bohemian Crown in 1367. The Ludovingians or Ludowingians were the ruling dynasty of Thuringia and Hesse during the 11th to 13th centuries. The Division of Altenburg was the plan for the division of the Meissen lands agreed upon by the two hostile Wettin brothers Elector Frederick II of Saxony and William III on 16 July 1445 at Altenburg. The brothers had attempted to reconcile, but eventually the division led the Saxon Fratricidal War, which began in 1446 and lasted for five years, until the Peace of Naumburg was negotiated in 1451. Following the peace, the subsequent Treaty of Eger in 1459, and the deaths of Frederick II and Wilhelm III, the two sons of Frederick II eventually gained control of the land of both their father and William III. Theodoric IV, Landgrave of Lusatia, also called in German Diezmann, or Dietrich III was a member of the House of Wettin. He was Margrave of Lusatia from 1291 to 1303. He was also Margrave of Osterland from 1291 until his death, and Landgrave of Thuringia, as Dietrich I, from 1298 until his death. Ludwig II, Landgrave of Thuringia, nicknamed Louis the Iron.